Yes, I've combined peanut butter, caramel and bittersweet chocolate. Is it too much? Is it sinful? Gluttony is a sin, right? Oh come on, that's not fair. If this is a sin, then bring on the flames. 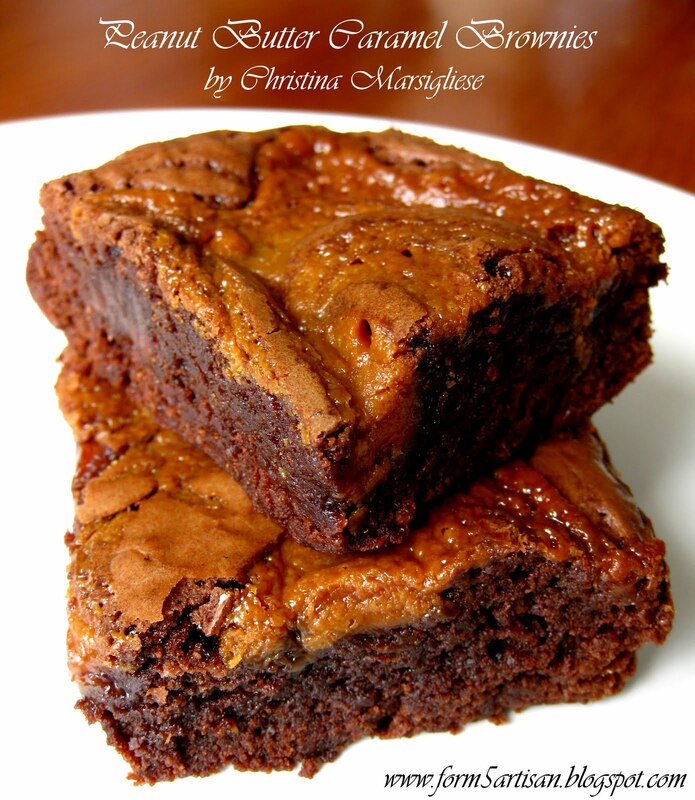 These brownies are amazing. How should I describe them...? 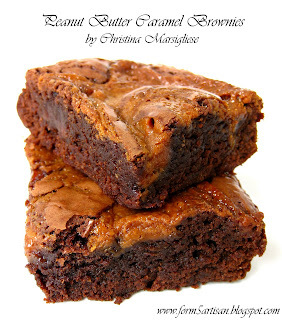 Maybe, rich, moist, fudgey, gooey, dense, chocolatey, absolutely delicious? They're really good. The peanut butter caramel is slightly sticky and chewy. Its texture is reminiscent of soft fudge. For this recipe, I gently beat the sugar into the eggs instead of stirring the sugar into the melted chocolate and butter. Although I make brownies using both methods, this technique ensures that the sugar dissolves in the batter. The egg whites are mostly water and provide a good medium for dissolving sugar. I've read a lot of recipes for brownies that instruct the baker to stir the sugar into the chocolate until it is "dissolved", but I have to disagree since chocolate has a relatively high fat content and contains very little water. So, such a high quantity of sugar that is used in a brownie recipe would never dissolve in a mixture of dark chocolate and butter, no matter how long you stirred. I wonder if anyone ever followed one of these recipes and just never stopped stirring because they were waiting for the sugar to "dissolve". That would be a horrible way to lose and arm. Wait, maybe that would be a great story..."I lost my arm making brownies". Ha, funny. No? Like I said, stirring sugar into chocolate still makes terrific brownies! It's just that depending on the recipe, it may lead to a thin crust of undissolved sugar on the bottom, and frankly, that's just not what I was going for in this recipe. 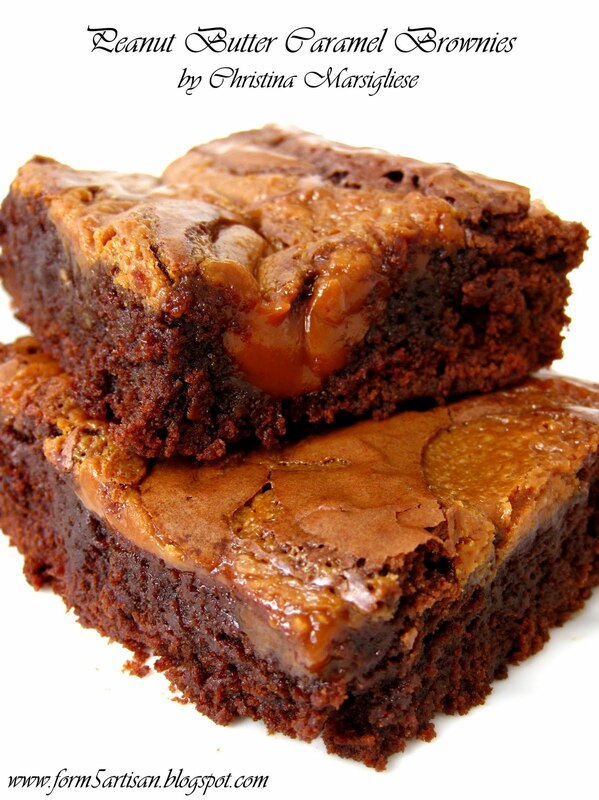 Without further delay, I present to you my Peanut Butter Caramel Brownies. Try not to eat half the batch immediately out of the oven like I did. I promise, you'll be even more rewarded if you wait until they cool to room temperature. Or, better yet, let them chill in the refrigerator for a few hours. 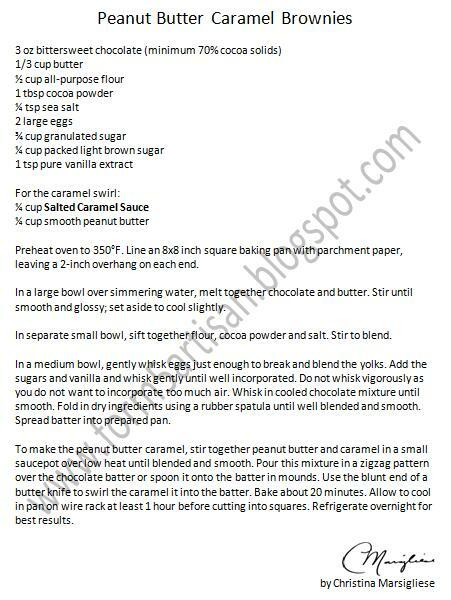 For this recipe you will need to make a batch of luscious Salted Caramel Sauce, which can easily be made a week in advance and stored in an airtight container in your refrigerator. Just a warning, though....if you make it in advance, chances are slim to none that you'll have any left by the time you actually decide to make these brownies. So, gather the courage and will power now, because I'm almost certain you'll need it. Thanks for posting the recipe. And I think it's a great idea that you provided a jpg of the recipe. Unfortunately, ti comes out really fuzzy when I print it, and the ingredient contents are not very clear. Either a higher quality jpg or one that's bigger size when printed would be more helpful! Thanks for letting me know! I'll try to improve the jpg quality of the recipes for next time. 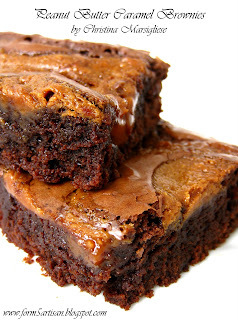 In the meantime, enjoy the brownies! These look soooo good!! Love brownies!! Thanks. 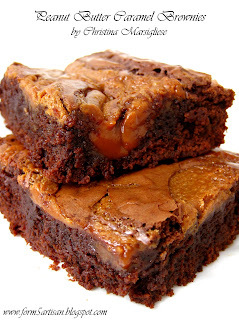 Yes, brownies are the perfect food. peanut butter is actually my least favorite food on the planet (weird, i know). but your pictures are so beautiful i kind of want to eat these anyways. keep up with this blog, i think it's amazing! I'm following you for suuuree! i love a food chemist or baker. they are almost the same! I want to eat your blog! Thanks everyone! Keep baking - it's good for your brain! Oh my goodness - I love this!!!! I will have to try these over the weekend and next weekend I'll have to try the WW chocolate chip cookies!. Just out of curiosity - is there a reason why you post your recipes as jpgs? It makes it hard to transfer into my recipe program (maybe that's the point??). It would be helpful to have them as text in your post so I can copy and paste, if you would consider doing that. Either way - thanks for the amazing recipes and congratulations on your upcoming wedding!! 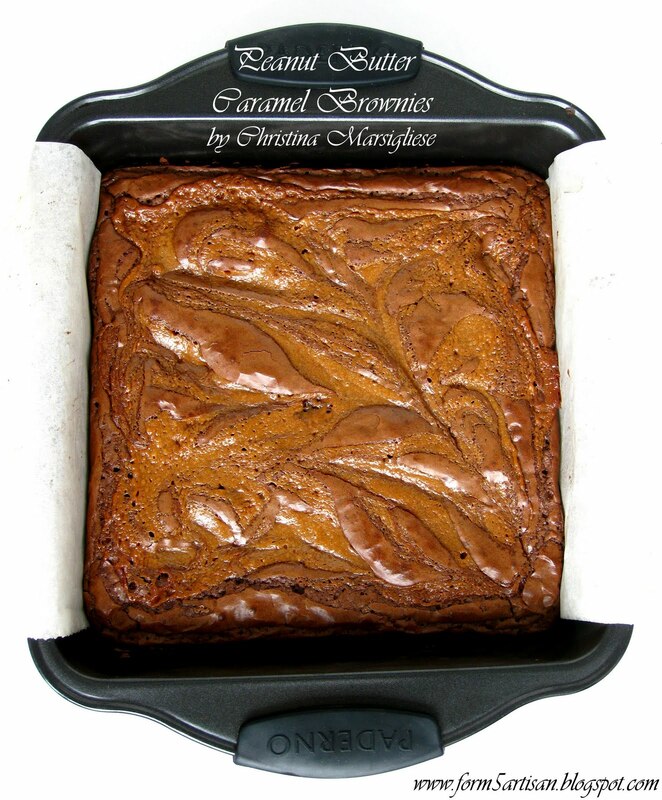 @ Turenchalks - I like the look of posting a recipe as a jpg. It looks more like a page from a cookbook. 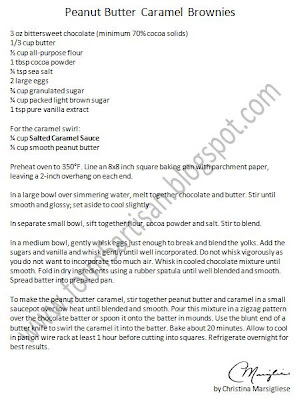 If you click on the recipe itself it should open up in a new window where you can zoom in slightly and read it clearly. I hope this helps! 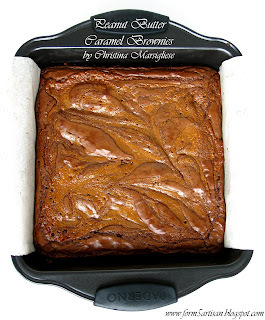 These brownies look so yummy and delicious! Yum and delish for sure. Drooooling! What an incredible combination!!!! Just found your blog tonight and I think I'm in love. I'm a research scientist who has been dabbling in the kitchen with limited success, but I think the tides have turned. You are the reason I am renewing my gym membership tomorrow for both me and my husband. I can't wait to get my hands on your cookbook. THANK YOU!